Well, it’s out first Saturday in June and weather permitting, you’re likely to find me in and around my garden shed. Painted and shingled to match the main house, and replete with decorative shutters and flower boxes I use it as the vast majority of North American sheds are used, as a place for a bit of potting and to store a couple of bicycles, a lawn mower and an assorted collection of garden tools. Here in the States, and despite their exteriors, most sheds are rather utilitarian storage structures, with lingo to match – taking someone to the woodshed,” is a term that generally means, “to mete out punishment” (if only figuratively) and was derived from the once common American practice of disciplining wayward boys away from public view. Conversely, everyday sheds in the the UK are often viewed as inviting places to actually inhabit for hobbying or tinkering. Sheds, according to Gordon Thorburn (author of “Men and Sheds”) are a veritable “male necessity,” providing a “place of retreat” for much-needed solace. Right, but whether male or female this notion of solace is certainly one that many artists have cottoned to. 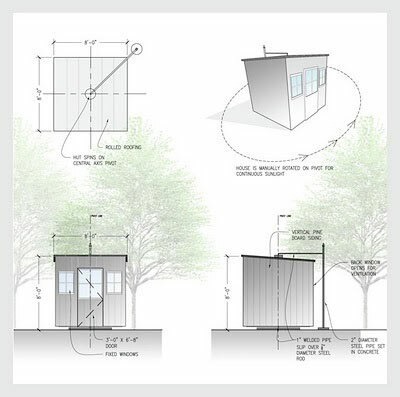 I also have a number of friends who run small businesses from their (expanded, sometimes beautifully appointed) sheds. 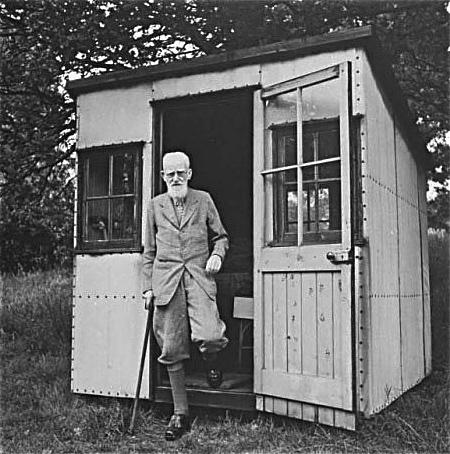 But when it comes to outright shed-creativity, the true champion (in my opinion) has got to be George Bernard Shaw who, for the final decades of his life, worked within the confines of an inredible writer’s shed that he had designed for his Hertfordshire property. To have a rural shed hooked up with electricity, a telephone and a buzzer system in the early half of the 20th Century was remarkable in itself, but what truly made this the Shed of Sheds was the fact that it was built on a turntable, enabling Shaw to push it around to follow the sun. While it lacked that marvelous turntable, there was ample room for a desk and a case for my books, with windows to steer away the elements and allow me to gaze out at the stars. And while my heating source was a not-very-efficient paraffin heater, there was electricity for my archaic electric typewriter, my battered radio and (certainly not least) my espresso machine. After a year or so I had the entire back wall papered with rejection slips, a cautionary tale to you writers about the futility of unsolicited submissions to publishers through the “slush pile” route. Although I’ve since come to enjoy the more spacious comforts of attic “garret” offices, there remains something fresh and primal (not to mention cozy) about retreating to the rustic interior of an open-windowed shed. Even if it does let in the rain on occasion, as in today’s selection (…at last) by Gabrielle’s brother, Nick Drake, recorded in 1969 and featured on his debut album, Five Leaves Left. When it snowed he felt just simply sad. She said I’m sorry you’ll just have to find a friend. You’ll find that sheds are nicer than you thought.